The purpose of DigitalCommons@UMaine is to provide long-term access to the scholarly and creative output of University of Maine faculty and staff. Consult this suite of tutorial pages to learn how to archive your work. Log in to Digital Commons via the My Account link. Select the default “Not yet posted” status from the “State” dropdown (see illustration below). Click on the title of the document you wish to review from the list of search results. 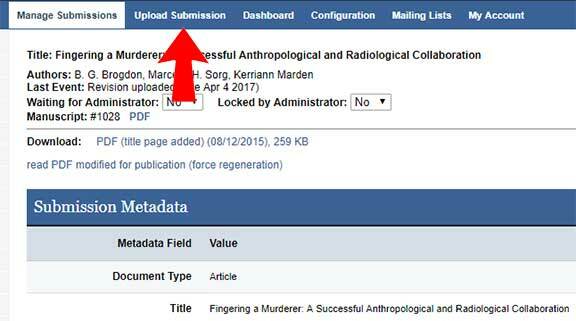 Review the existing metadata in the Submission Metadata page (see illustration below). 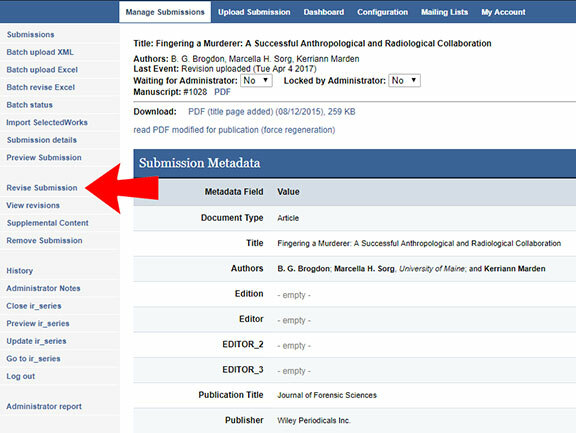 Click on the “Revise Submission” text link in the left-hand menu (note red arrow in illustration above). Scroll through the metadata upload interface, making edits as necessary. Double-check to confirm all desired edits and changes are in place, then click “Submit” at the bottom of the form. Click “Manage Submissions” from the top menu bar. Repeat the previous steps for each unpublished submission that requires review. Click “Upload Submission” in the menu bar across the top of the page. Scroll to the bottom of the interface and click the “Cancel” button. Check the tick mark next to each title read to be published to public view. Click the “Publish & Update selected” button only once to avoid duplication. Congratulations! You have successfully edited and published the selected files to the public view in Digital Commons. Allow 20-30 minutes for the papers to become visible in the public interface. New content may not be indexed until the following day. Scope your search to “All” in the “State” dropdown menu and select the appropriate field to search, typically by author “Last Name is” or “Title” is or “Title” includes and enter the appropriate information in the text box. 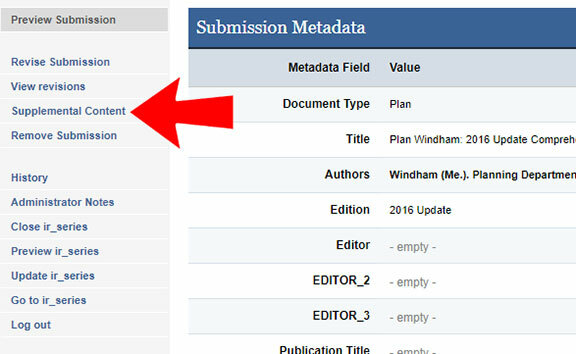 Review the existing metadata in the Submission Metadata page. Click on the “Revise Submission” text link in the left-hand menu, if edits are needed or if you need to replace the attached electronic file (PDF). Publish your edits to the public view by clicking “Update ir_series” in the left-hand menu. Click “Update ir_series” in the subsequent Series Configuration page. 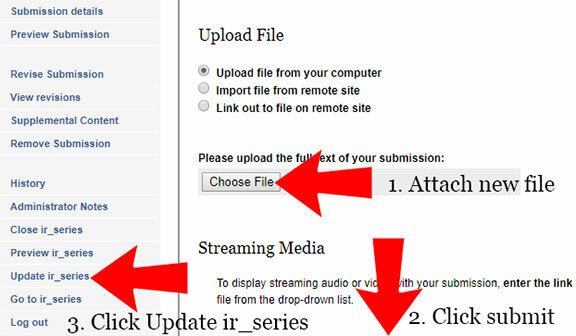 Scroll down the metadata form to the “Upload File” heading and follow the numbered steps illustrated below. Select the appropriate radio button and click “Choose File” to navigate to the appropriate document. Scroll to the bottom of the form and click the “Submit” button. Wait for the Submit action to complete then follow steps to update published submissions, above. Click on the “Supplemental Content” text link in the left-hand navigation menu to revise or attach new or additional supplemental content. Follow the numbered steps illustrated below. Upload a new file, click “Choose File” and navigate to the file you wish to attach. Repeat the previous two steps until all supplemental content is attached. Click the “Revise Submission” link in the left-hand menu.